OK, lets make our own Android ICS tablet based on PandaBoard and our 10″ LCD bundle. We will use Linaro 12.01 build. We will need Ubuntu 11.04 x64 as a host machine. I tried different others hosts including 10.04LTS and 11.10, but only 11.04 x64 gave me working result. You can install your machine in VirtualBox – that’s exactly what I did. Just turn on Intel virtualization (VT-x) option in BIOS an enable it in VirtualBox. Also, you will need around 40 Gbytes of free disk space. Oracle forced to remove Java JDK from standard Ubuntu repository recently. Therefore, we will use small trick to install JDK. This will download > 2 Gb of sources and will take around one hour (highly depends on your Internet speed). If you have multi-core processor, then you should try to use “make -jX …” to speed-up compilation. I used “make -j8 …” on my i7 processor. Compilation time highly depends on your computer and can vary from 20 minutes to several hours. You will see the list of storage devices, you should find out which one is your SD card. Mine has name “sdb”, and I will use it in the next command. We use here “sdb” as a name of SD card. Now remove SD card and insert it again – you will see several partitions opened in separate windows. Here we again use “sdb” as a name of SD card (2 is added to point to system partition). Now we have working Android with correct LCD output, but our touchscreen doesn’t work. Well, that’s right time to recompile kernel to add touchscreen support. Lets’ proceed! Now we have working touchscreen, but it works really weird – only left top corner is working as projected to whole screen. This is because Android gets HDMI default resolution (1920×1080) and assigns it to touchscreen. Our touchscreen is connected through USB and is considered as “external” device, so Android thinks it is related to HDMI input. Therefore we have to configure touchscreen to be considered as “internal” device (just set parameter . Then Android will assign DVI resolution to it. You should have fully working touchscreen now. Brightness level in LCD panels is controlled by pulse-width modulation (PWM). PWM is a simple turning the switch between supply and load on and off at a fast rate. The longer the switch is on compared to the off periods, the higher the power supplied to the load is. The PWM switching frequency has to be much faster than what would affect the load, which is to say the device that uses the power. Typically, switching frequency is set to about 200 Hz in most LCD backlight control units. The term duty cycle describes the proportion of time when switch is on to the regular period of time. A low duty cycle corresponds to low power (low brightness in our case), because the power is off for most of the time. Duty cycle is expressed in percent, 100% being fully on (max. backlight brightness). Below are several examples of different duty cycles. That’s exactly the waveforms that you can see with oscilloscope connected to pin 4 of connector CON4 on our v2 PCB. PWM waveform is generated by PIC12 microcontroller (U3) on our PCB. The duty cycles of PWM depends on voltage measured on its pin 7 (AN0) that is used as an input to internal analog to digital converter (ADC). We supply our LCD bundle with ambient light sensor connected to this pin. PIC12 measures voltage 10 times every second, and smoothly changes PWM duty cycle. Full cycle of brightness change takes 2 seconds to avoid screen flickers. Here is short video that shows how this works. For manual brightness change you can substitute ambient light sensor with 10K variable resistor. Now you can turn knob to control brightness of screen. Please, be aware that it has the same delay of 2 seconds to change brightness to new level. And finally, short video of manual brightness control in action. Also, you can increase default brightness level by adding resistor in parallel with light sensor. 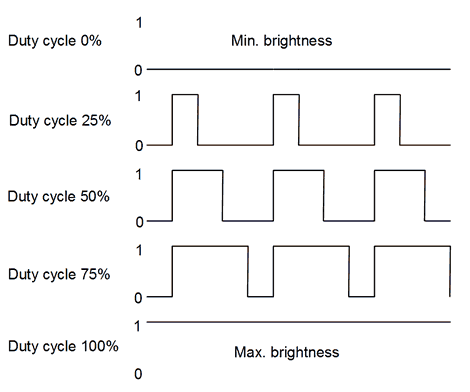 The lower value of resistor will provide higher default brightness level. First of all, please follow below instructions to make required modifications to your mainboard (click on your mainboard name near “+” to get additional details). You should install headers J4 and J5 on BOTTOM side of BeagleBoard. You can add these headers as an option to any product in our web-shop. You should install headers J1 and J4 on BOTTOM side of PandaBoard. Also, you should remove 28 resistors on top side (R40-R43, R45, R46, R48-R53, R64-R73, and R80-R85), and install 33 Ohm resistors R176-R203 on bottom side of mainboard. See pp.32-36 in PandaBoard System Reference Manual for details. You can add these headers and resistors as an option to any product in our web-shop. You should install headers J1 and J4 on BOTTOM side of PandaBoard-ES. You can add these headers as an option to any product in our web-shop. Connect LCD data and power connectors to LVDS PCB v2 like on drawing 1. 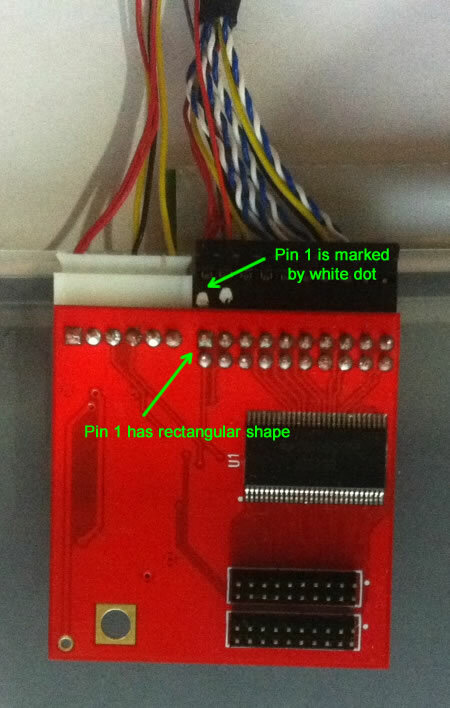 Pin 1 is marked by white dot on data connector, and has rectangular shape on PCB. Power connector has key and can’t be inserted wrongly. Place PCB v2 to your mainboard. Please, pay attention that LCD and power connector on our PCB should be pointed toward center of motherboard (click drawing 2). 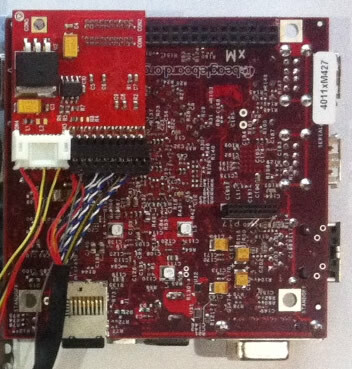 You should get connection like on drawing 3 (BeagleBoard-xM is shown).